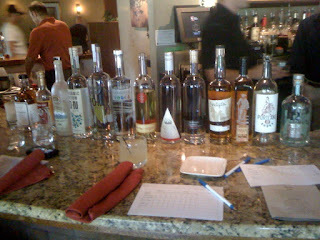 Savor It : A Mixology Competition for...the Upcoming School Year? 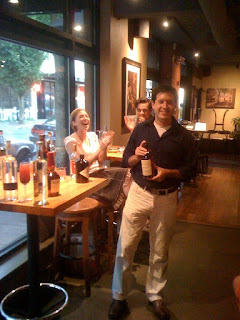 A Mixology Competition for...the Upcoming School Year? On Monday, July 27, the sun beaming down on the city of Portland caused temperatures to hit record highs in the 100s. 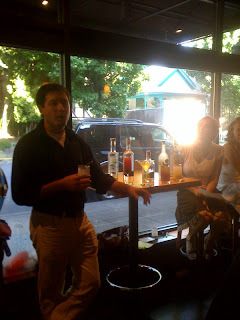 That was an even deeper incentive, I thought, to attend an event centered around some of Portland's finest distilled spirits that would be concocted by a few of the city's most creative mixologists, served cold, and most likely both shaken, and stirred. 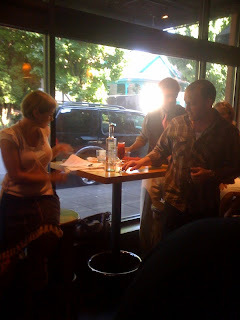 Hosted by the Oregon Bartenders Guild (OBG) and held at Hobnob Grille in SE Portland, the OBG Mixology Competition challenged six Oregon bartenders to create their own signature drinks in a two-round competition utilizing Oregon-crafted spirits all in a benefit for Schoolhouse Supplies, a school supply store that offers free educational materials for Portland-area teachers. 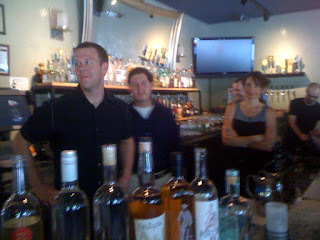 The chosen mixologists: Bradley Dawson, Belly Timber; Sue Erickson, Ping; Kinn Edwards, Aqua (Corvallis); Evan Zimmerman, Laurelhurst Market, Jacob Grier, Carlyle; and Alison Dykes, Lincoln had one week to develop two cocktails, each made with a specific Oregon spirit. 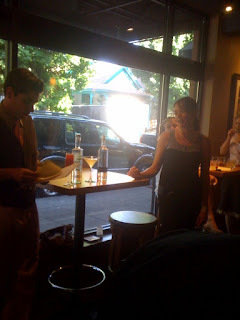 The cocktails would be judged in two rounds by all attendees in the categories of presentation, taste, aroma, and originality. The bar stools were full and the restaurant's booths fashioned eager attendees waiting to sip our three-ounce samples of each creation. 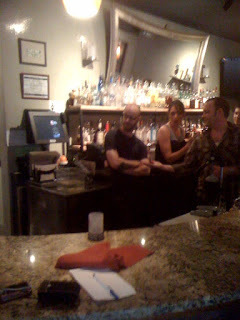 All situated behind the bar's counter, the bartenders appeared to be a team of one as they all pitched in and assisted one another prepping pours and passing out libations of each cocktail one by one. 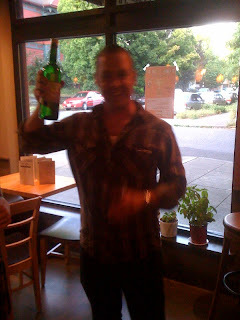 And the evening continued on in that fashion. As we continued to sip samples (which seemed to grow larger than three ounces by night's end) and enjoy Hobnob nibbles, the conversations grew, laughs became more prominent, and all in attendance appeared to enjoy a fun night for a great cause. I must say I was blown away to see some labels that I had previously never seen. 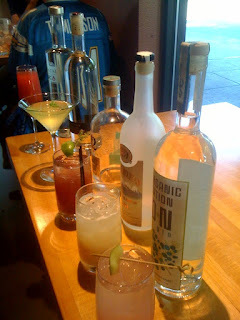 It was a fun exploration into Oregon spirits that truly brought home the fact that Portland (and Oregon in general) is not only a mecca for fabulous food, but also an incredibly viable player in the boxing ring of delectable spirits. A few more pics from the night, including the winners! 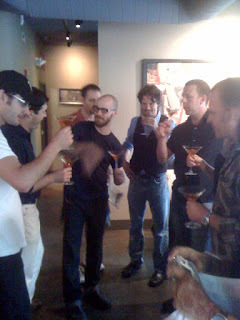 All bartenders in a perfect end to the competition, the celebratory toast. Fun night for an excellent cause. appreciate in case you proceed this in future. Numerous folks can be benefited from your writing. I'm now not positive whether or not this post is written by him as no one else recognize such specific about my difficulty. You are wonderful! Thanks! Thank you so much and I'm having a look forward to touch you. Will you please drop me a mail? Quality articles is the important to be a focus for the users to visit the web page, that's what this website is providing. My family members all the time say that I am killing my time here at web, however I know I am getting experience all the time by reading thes nice posts. you are not understanding anything totally, except this piece of writing presents fastidious understanding yet. to be shared across the net. Disgrace on the search engines for now not positioning this publish upper! It's going to be end of mine day, but before finish I am reading this wonderful post to improve my know-how. Thanks to my father who told me regarding this blog, this blog is genuinely amazing. Thanks for every other fantastic article. The place else may anyone get that kind of information in such an ideal approach of writing? are imitation, fake UGG Boots. fake, imitation UGG's, they would arrive inside a plain, brown box that looked battered. ì (IE: sand, chestnut, chocolate, black) UGG boots. Nevertheless, with super delicate ease and convenience, increased desire, and winter weather season approaching, you can still discover some very nice provides. Emu Boots sale up to 50%, and in case you pay for two main couples of uk ugg boot, many surplus treats is going to be offered. People of each and every class and level can simply get these because their price is of every range. Many customers have stated that when they have ordered these counterfeit, fake, imitation UGG's, they might arrive in the plain, brown box that looked battered. If you have no idea about whether boots you want are real or otherwise not, it is advisable not to get them. In addition, when you seem at the labels for the manufacturing site, you really should bear in mind that this labels which exhibit "Manufactured in China" are authentic, and a lot of others are counterfeits. My web page edujobs Circular"
I eat, I write, I explore, I admire. And each day, I possess an insatiable appetite for inspiration. I'm a writer, a Le Cordon Bleu grad, and a girl who just can't seem to stay away from the food world. I took a break from corporate America a few years back, trained at Le Cordon Bleu in Portland, OR, and did a bit of food writing. That's why I went; to be trained about the culinary world and then go out and write about it, knowledgeably. I've had a few distractions throughout the last couple of years, but something always brings me back here, and to the world of food. Savor It is a labor of love for me. I don't do it to make money. I come here to post my discoveries and musings on the food world, as well as travel. The blog is, and will likely continue to be, a work in progress in terms of design. I'm always coming in and tweaking fonts or changing the header. It's just my place to play, write, and share a piece of myself with you. I hope you enjoy what you find here as it progresses, and that I keep you coming back for more.